It’s Grace. Camp is absolutely wonderful. Because I’m taking care of ten eleven-year-olds (they’re cuddly and sweet and I adore all of them), I’ve been a little too busy to read much. We do have rest hour after lunch but I crash after teaching dance in the morning and nap from the first bell to the last. But camp is where I return to myself and so I relish being here, trying to “be a great girl” and have my campers love Illahee as much as I do. I’m going to try and do a couple editions of mini-reviews, spurts of two or three at a time. Aside from that, I have a new feature coming (!!!) once I get the graphic from my fabulous designer as well as a blog tour in the works. So WLS is definitely starting back up again after my hiatus. On my time off, I finished Stand-Off by Andrew Smith, and a few others – warranting a full review later on. Without further ado, here are my thoughts on some of my most recent reads. Sixteen-year-old Beckan and her friends are the only fairies brave enough to stay in Ferrum when war breaks out. Now there is tension between the immortal fairies, the subterranean gnomes, and the mysterious tightropers who arrived to liberate the fairies. But when Beckan’s clan is forced to venture into the gnome underworld to survive, they find themselves tentatively forming unlikely friendships and making sacrifices they couldn’t have imagined. As danger mounts, Beckan finds herself caught between her loyalty to her friends, her desire for peace, and a love she never expected. This stunning, lyrical fantasy is a powerful exploration of what makes a family, what justifies a war, and what it means to truly love. I’ve read one or two of Moskowitz’s contemporary reads – which I enjoyed, although I thought they were really gritty. This one is no exception. You definitely have to have the stomach for it, yet Moskowitz writes in such a unique, engaging way that it makes me really wonder what goes on inside her head. This book makes you uncomfortable because of how thoroughly it tackles the issues. It’s filled with so many raw ideas and emotion that it strips you of everything you have. While slow-paced, the elaborate world-building and complexity of each character kept me enthralled. The fragmented writing style did it for me. As my blog name suggests, I seek silver-tongued writers, and Hannah Moskowitz fits the bill. Her poetic style and lithe, fearsome way of exploring her characters was gratifying to me. And one more thing – the packaging? The team at Chronicle must be BRILLIANT because there were little details – “glued in” pages, drops and scrapes on the pages, that built the character of the medium itself. What’s more, that actually makes sense within the story. It’s a story that feeds directly off the book, and vice versa. It’s both heart-wrenching and fearsome, but rooted in such a building fashion that it’s never overwhelming. I don’t think it’ll appeal to everybody, but I think those who read it will appreciate it. It’s weird, but I loved it. I picked up this read expecting a nice fairy-tale retelling, but I was greeted with even more: a lush cultural background, dreamy description, lovely language. I’ve heard a few mixed things about the book but I really loved it. The main character was thoughtful. She volunteered to save her sister (a familiar trope, hey) but the way she did it made it even better. Her description and melancholy march to her death was saturated with this poignant internal monologue, and plenty of imagery. The stories themselves were rooted in a very old-timey feel that I adored. For some reason, I’ve heard a lot of mixed reactions about this one. It tells more than shows but is also so absorbing and gorgeous that I’m totally okay with that. I think there are some cultural details that are really under-explored in YA and so I loved the feel of this one – and will definitely be seeking it out in the future.So I found this one fascinating, and absolutely captivating. Leila Sales does an excellent job creating characters I care about. She’ll start off with a touching anecdote about their childhood – how they developed into who they became – and I’m hooked. It happened with Elise in This Song Will Save Your Life and it happened again with Arden in Tonight the Streets Are Ours. While they’re two separate, multifaceted characters, they shared the same empathy and strange innocence that made me connect with them thoroughly. The book itself was in third person, which I wasn’t expecting. Arden was likable, a bit plain. She was wholly tired of being pushed aside in search of bigger and better things – the type who would be “recklessly loyal” and put a friend before herself, no questions asked. She wasn’t self-centric, but she was anxious. She worried about her impact, how she affected people, how to deal with her mother leaving. I had a lot of respect for her by the end. Her story itself was thoughtful and slow, but still likable enough for me to fully LOVE it. It was sweet and had the perfect dashes of realism, those small human details that Leila Sales excels at – the reason why everyone was clamoring for this read in the first place. It was cute and humble enough and everything I could look for in a sweet read. I think it’ll be a solid read for a lot of girls (and guys) looking for good stories. What have y’all been reading? 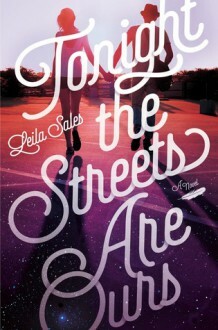 I’m excited to read Tonight The Streets are Ours and A Thousand Nights! Both of them sound like lovely reads, and just knowing that you’ve adored them makes me look forward to reading them even more. Great mini-reviews, Grace! Glad you’re having fun at camp! Thanks Alexa!! Love your comments! Grace, I’m so happy to hear that you’re loving taking care of the camp kids – your pictures on Twitter are absolutely ADORBS! As for your mini-reviews, kudos to you for writing some even while away! I have to be honest – A HISTORY OF GLITTER AND BLOOD does not seem like my type of read. I’m actually pretty scared to pick it up because of all of the reviews it’s been getting. I know you appreciate unique writing styles, and while I haven’t read Moskowitz’s work before, I have a feeling that her writing is exactly that. I’m definitely curious about the story though! Eeeek – A THOUSAND NIGHTS! I’ve been craving another One Thousand and One Nights retelling ever since THE WRATH AND THE DAWN. So happy to hear you enjoyed this one! I love when authors flesh out the culture in a book. And while this one seems to be more tell than show, if it’s enjoyable, I’m willing to give it a shot regardless! THIS SONG WILL SAVE YOUR LIFE didn’t seem to resonate with me the way it did to a lot of people, but I’m willing to give Sales’ books another try. Arden seems like a very perceptive character, one I’d like to meet for sure. Wonderful mini-reviews, Grace! I’m so pumped to see what you thought of STAND-OFF. Also, NEW FEATURE & GRAPHIC? So much excitement!! I’ll admit, it took me a few minutes to get over the fact that THIS SONG WILL SAVE YOUR LIFE didn’t resonate entirely with you. I’m curious to talk with you about it – twitter convo soon? Love your points on all my reviews! Eeep, I hope you’re enjoying your time at camp! I love that you use this time to really reconnect with you- although I’m definitely excited for this new feature (!!!!) and all the future posts on your lovely blog. A History of Glitter and Blood sounds like my kind of read! I’m always craving that deep, gritty read that deals with raw emotion because those are the kinds of books that really make me feel and just rethink my entire life. The little inserts also sound so cool?! Like I want that book NOW, please. I’ve also heard a lot of mixed thoughts about A Thousand Nights but I’m really thrilled that you enjoyed it so much! The cultural aspects you mention really have my interest piqued, and I think I’d love to explore something that’s underrepresented in YA. Though, I do think the telling vs. showing thing might irk me. Hopefully I’ll still enjoy it!! I got the chance to read Tonight the Streets Are Ours , and I really agree with your thoughts! While I was a bit underwhelmed- the plot was pretty slow until the very last part of the novel- it was so, so thought-provoking. As in, I’m STILL thinking about the novel, weeks after I read it. I grew to love Arden, and loved the hidden messages in the story, and the overall theme of empowerment and doing what YOU want to do. YOU GIVE THE BEST COMMENTS EVAH!